Check out our collection of game-changing relationship management tools, including: Networking apps, relationship management software, and personal CRMs—to give (and get) the most from your network this year. If you’re in a referral-based business—meaning 80%+ of your opportunities come from your network—the health of your relationships is generally a good indication of the health of your business. As a result, we at Mindmaven believe the best things in life come from our relationships, but there’s a catch: Your ability to generate the game-changing opportunities you need hinges on your ability to stay relevant and top-of-mind to the most important people in your network. And left to our own devices, that’s a challenge. According to the Dunbar Number, the average person can only effectively manage about 144 relationships, max. Thankfully, the rise of relationship tools has made it easier than ever to surpass the Dunbar Number and manage more relationships than ever before. And today, I’d like to share some of my go-to relationship management tools. I hope you’ll find them as valuable as myself and many of my clients have. Asana is a highly-customizable, collaborative task management solution that enables you to follow through on 100% of the commitments you make. Trust is one of the most important factors in any relationship. In fact, I’d go so far as to say that if you don’t have trust, you don’t have a relationship. Enter Asana: As a task management solution, it isn’t what most would think of when they think about relationship management tools; yet it’s easily one of the most valuable on the list. Why? Because trust drives relationships, and trust is largely driven by one thing: Follow-through. Your ability to consistently follow through on your commitments—large and small—is a vital component of relationship success. By utilizing a tool like Asana to capture every commitment made to and by you, you can ensure you’re the one person in your network who follows through on 100% of their promises—and trust me: People notice that, and the impact this makes in your relationships can’t be overstated. Zoom is a powerful video calling and virtual meeting tool designed to help you communicate more effectively with the relationships that matter most. I perform the majority of my coaching sessions via video calls. Don’t get me wrong: It’s not that I believe the online experience is better. Quite the contrary: Face-to-face meetings (especially when paired with a great follow-up email) will almost always be superior. But the reality of my work requires frequent meetings, and my clients’ calendars are often full to bursting. So although someone may not be able to carve out time away from the office to meet in person, most can make the time for a video call—and I’ve yet to find a better video calling platform than Zoom. Their extensive feature set—including custom “rooms, automatic call recording and cloud storage, and a surprisingly accurate auto-transcription too—makes congruent communication a breeze; and after trying a number of video calling tools over the years, these same features make Zoom our go-to solution. If video or phone calls are a regular part of your workflow, I highly recommend checking out Zoom as a viable solution. It’s especially valuable if you couple it with this 60-second tip to make any video call more personal. Contactually and FullContact are powerful CRMs that enable you to identify the most valuable people in your network, and equip you with the relationship management tools to stay top-of-mind with the people who matter most. Remember the Dunbar Number I mentioned above? As a reminder, it posits that the average person can only manage around 144 relationships. While that may not be a problem for some, anyone in a referral-driven business knows the necessity of managing hundreds—if not thousands—of relationships. But equally important is understanding that not all relationships are created equally. While you may have 2,000 people in your network you need to manage in some shape or form, it’s likely only around 200 would really be what we call Legends. So how do you know who your Legends are? And how do you know when—and how—to interact with them? Those are some of the problems Contactually and FullContact aim to solve. I’ve had the pleasure of working with the folks at Contactually for years now, and they’ve incorporated many of our best practices directly into their CRM. One of my favorite features is their customizable follow-up reminders, enabling you to ensure you’re top-of-mind with the Legends and Champions in your network. FullContact is another powerful solution for anyone managing a sizeable network. Their tagging features make it incredibly easily to organize and rate your network so you can ensure you’re focusing your efforts on the relationships that matter most. Affinity helps teams manage and grow their networks by unlocking introductions to decision makers and auto-populating pipelines to increase deal flow. In industries where success is contingent upon maintaining high-touch relationships, Affinity allows you to get deeper insights into your network. As your goals grow and evolve, so to should your network—and perhaps the most effective, organic way to grow a network is through introductions. Chances are, many people in your network are connected to at least one person you’d benefit from meeting. The problem is, we often don’t have the transparency into our network to see who those people might be. That’s where Affinity comes in. Who in your network can bridge the gap and make an introduction. If you’re in a referral-based business, Affinity is an invaluable tool to growing and unlocking the full potential of your network. Offering an introduction is one of the easiest ways to provide meaningful, relevant value to your network, and Entro’s templates and reminders make the process easier than ever. One of the best practices we teach our clients is to never leave an interaction without offering the other person something of value; and one of the best ways to provide meaningful value is to offer an introduction. But introductions come with a pretty hefty tax. Although the concept is simple, doing the process right is surprisingly complex. Not only does making an introduction require a substantial amount of time, it also demands a good deal of your brain’s processing power. Entro is a free tool designed to “take the hassle out of referrals and introductions.” While Entro doesn’t automate the entire introduction process (such as the initial double-opt-in), their templates and automated post-introduction follow-up does make the second half of the exchange much more streamlined. SaneBox is one of the most powerful inbox organizers on the market, and their intuitive filters help ensure you only see what you need to see, when you need to see it. Without clear rules and boundaries in place, the inbox is often where productivity goes to die. What was meant to be a “quick check” can easily turn into a 2+ hour time sink. When you have 50+ unread messages, finding the 2-3 that are actually important can be daunting. Enter SaneBox. SaneBox is a “trainable” email management tool that automatically sorts and filters your emails in real-time. The best part? The more you use SaneBox, the smarter it gets. It learns your organizational preferences and sorts your inbox accordingly. Short of working with an Engagement Manager, SaneBox is one of the most powerful tools out there to ensure you’re focusing on the emails, conversations, and relationships that matter most. CamCard creates a digital database for every business card you receive, ensuring nothing falls through the cracks. Coupled with their CRM integrations, this is a powerful tool for networkers or regular conference attendees. If meeting new people or attending networking events is a regular part of your life, having a better way to manage your growing pile of business cards is a must-have; and while there are a lot of tools on the market, CamCard is one of the best. Create follow-up tasks and reminders for specific relationships. While this tool may not be for everyone, it’s a must-have for anyone who regularly exchanges business cards. These two phone dictation apps make it easy to record your thoughts and capture key takeaways after meetings, allowing you to build a rich database of relationship-driven information. Capturing this information allows you to provide highly-relevant interactions in the future (and, coupled with Asana, ensures no commitments fall through the cracks). But finding the time to sit down and write out a debrief after a meeting can be difficult, especially if you’ve got a day full of back-to-back meetings (by the way, here’s how to avoid that). Today, on November 21st, I met with John Smith from Rapple. I learned that John has two daughters: Mary, age 3, and Catherine, age 5. He’s been married to his wife Erin for 9 years. He and his wife enjoy finding new areas to hike in. I committed to sending John that article I read about some of the best hidden hiking locations in the Bay Area, and we agreed to meet again next month, after he’s had a chance to talk with his board about moving forward. You could dictate that entire thing in 30 seconds or less; even on the way to your next meeting. Then, once you have time at the end of the day, you can sit down and process your debriefs. Or even better: If you work with an assistant, have them use your debriefs to automatically update contact profiles. To learn more about performing meeting debriefs, check out 1 Simple Tactic to Supercharge Your Meetings and Deepen Your Relationships. The ten tools above are some of our top, daily, go-to resources. But the list certainly isn’t all-inclusive. There are dozens of other great tools myself, my team, and my clients have been exposed to over the years—and I’d like to spotlight a few of them here. And while our experience with the tools below may not be as encompassing as those above, they’d still make powerful additions to any repertoire. So without further ado, here’s 10 more networking tools to give (and get) more value from your relationships. Accompany – Put simply, Accompany was a brilliant web and mobile app that allowed you to be the first-to-know and first-to-respond to relevant news about the most important people in your network. I say “was” because, as of writing, they’re not currently taking new users. But when that changes—or if you’ve already signed up but haven’t fully levered this powerful tool—be sure to check out our Accompany guide! About.me – About.me allows you to create a simple profile to present who you are, what you care about, and what you do on a single page. It’s a powerful tool for online reputation management, and for ensuring the digital first impression you make is the right one. Missive – Anyone familiar with our work may have heard about inbox shadowing—or the act of empowering your EA to manage your inbox as if they’re you. This concept can be rolled out using practically any inbox, but Missive is one of the best collaborative communication platforms I’ve come across—in many ways, it feels custom-built for shadowing, and allows you to deliver more high-quality interactions than ever before. Slack – Slack is our go-to team communication platform. As an entirely remote organization, we rely on Slack (in addition to Zoom) to collaborate on projects and build meaningful relationships, even though most of our team has never met in-person. Detective – Detective is an incredibly powerful automated research tool that puts together intuitive personal profiles for anyone you’re meeting with for the first (or 40th) time. This information enables you (or your assistant) to build powerful Icebreaker Profiles, ensuring you make a great first impression every time. Meetup – Common ground is the foundation of almost any relationship, new or established. If you’re looking to expand your network in a meaningful way, Meetup is a great way to find like-minded individuals who care about the same things you care about. Evernote – Value payloads—or pre-drafted email templates sharing specific items of value—are one of the most powerful ways to offer value to your network at scale. I recommend my clients have a repository of 25 VPLs at any given point in time, and the best solution I’ve found to store and organize these templates is Evernote. Outreach – If the relationships you’re focused on are prospects, Outreach is one of the most powerful sales engagement platforms on the market. Outreach boasts the ability to “make every customer-facing rep wildly productive” and, from what I’ve seen of the tool and know of the founders, that’s a claim they can back up. Mixmax – Mixmax is a Gmail plugin that provides unrivaled automation and analytics. Email tracking, powerful calendar integrations, and easy-to-use email templates and a host of other tools means Mixmax improves on nearly every aspect of the email communication experience. CircleUp – CircleUp is a smart little email follow-up tool that sends daily meeting summaries to your inbox prompting you to send meaningful follow-up emails (based on pre-written templates) for each of your external meetings. Let’s address the obvious: Is this list all-inclusive? Certainly not. 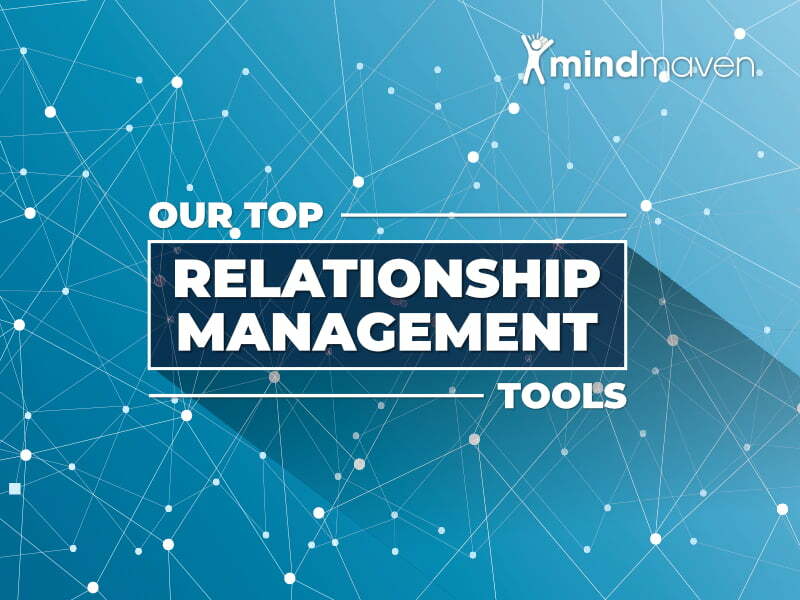 I’m sure there are a number of other brilliant relationship management tools on the market that didn’t make the list. Perhaps I simply haven’t used them yet, or maybe they just weren’t top-of-mind as I wrote this article. Either way, if you feel I left a must-have off the list, please feel free to let me know in the comments below! Who knows—maybe I’ll spotlight it in the next article! But until then, I hope this list has been valuable; and I feel confident in saying that if you master even just one of these network management tools, you’ll see a notable improvement in the quality of your relationships.